Citation: Roording RS, Willemse DS, Buitelaar J, et al. Working memory in children with mild to borderline intellectual disabilities: a systematic review of strengths and weaknesses. J Child Psychol October-2018;2(1): 16-22. BAS-II: British ability scales II; BIF: Borderline intellectual functioning (IQ 70-85); BPV-S: British picture vocabulary scale; CA: Chronological age; CFT: Culture fair intelligence test; CMMS: Columbia mental maturity scale; HAVIK-IV: Hamburg-wechslerintelligenztest für kinder-IV; K-ABC: Kaufman assessment battery for children; MA: Mental age; MBID: Children with mild to borderline intellectual disabilities (IQ 50-85); MID: Mild intellectual disability (IQ 50-70); PIQ: Performance intelligence quotient; SON: Snijders-oomen non-verbal intelligence test; TD: Typically developing children; WASI: Wechsler abbreviated scale of intelligence; WISC-III/ IV: Wechsler intelligence scale for children-3rd/4rd edition; VIQ: Verbal intelligence quotient. WPPSI-III: Wechsler preschool and primary scale of intelligence-3rd edition; WM: Working memory. Estimates of the prevalence of Mild to Borderline Intellectual Disabilities (MBID; IQ score 50-85) in the general population vary greatly, according to the definitions and methods used. In Western countries, the population prevalence of Mild Intellectual Disabilities (MID) is estimated to be 0.7% . On the basis of the normal distribution of intelligence in the general population, 2.14% would have an IQ in the 50-70 range (MID) and 13.59% in the 71-84 range Borderline Intellectual Functioning (BIF). Children with MBID encounter a diversity of learning problems, such as spelling, reading and/or numeracy . These problems appear often to be persistent and demand additional alternative support at school . Limitations in working memory appear to play a crucial role in the development of these learning problems, as well as in the development of behavioral problems both in typically developing children  and in children with MBID . The conclusion from an integrative review into WM of people with a learning disability was that WM performance is determined by the interaction between two types of moderators: personal characteristics (IQ, chronological and mental age) on the one hand, and task characteristics (verbal, visuospatial, executive functioning) on the other. The cognitive task burden influences this process . This study included a broad population both in terms of age range (children and adults), and the degree of intellectual disability (mild to borderline). Furthermore, people with intellectual disabilities and a specific syndrome (e.g., Down’s syndrome) were also included in this study. This hinders any conclusions about WM functioning in a more specific target group, i.e., children with MBID without diagnosed syndromes, as certain syndromes have specific WM profiles . Given that standardized interventions developed for cognitively able children are often too complex for these children, due to their limited cognitive and adaptive skills, it is important to start searching for alternatives. The more because children with MBID represents a significant group within mental health care. Prevalence studies have estimated that approximately 39% of children with a fullscale IQ score between 30 and 80 have an additional Diagnostic and Statistical Manual of Mental Disorders-Fourth Edition (DSM-IV) diagnosis , compared to approximately 22% in the general population  and are comparable with estimates found in other studies . Increasing our understanding will also offer more insight into what type of support is best for these children. Therefore, it is important to gain-through literature review-more insight into the strengths and weaknesses of WM in this vulnerable group of children. WM has been extensively investigated in recent years and is viewed as a central construct within cognitive psychology. Baddeley’s  WM model is the most utilized model within clinical practice and science for typically developing children aged 4 and above , as well as for children with learning problems  and for children with MBID . The WM model comprises four components: The visuospatial sketchpad, phonological loop, central executive and episodic buffer. The visuospatial sketchpad and phonological loop are responsible for the temporary storage of visual and verbal information, respectively. The so-called automatic rehearsal process can activate incoming information for the phonological loop. This is affected by the rate of speech and word length . Both the visuospatial sketchpad and phonological loop are coordinated by the central executive. This is an active attention system, which both saves and processes stored information, and uses information from long-term memory to carry out complex cognitive activities. Tasks that concurrently invoke the visuospatial sketchpad, phonological loop and central executive, are presumed to be WM tasks. The fourth component, the episodic buffer, stores information in a multidimensional code; this is also directed by the central executive and serves as a temporary link between the visuospatial sketchpad and phonological loop and long-term memory . This review employed a systematic literature review to investigate WM in children with MBID. The review evaluated whether WM in children with MBID differs compared to (1) typically developing children of the same Chronological Age (CA) and (2) younger, typically developing children with the same Mental Age (MA). It was assumed that children with MBID would do less well on WM tasks compared to children of the same CA, but as well as children with the same MA. This expectation is in line with the developmental theory that assumes that children with MBID achieve a lower cognitive ceiling compared to CA control children; however, it contrasts with the “difference” or “defect” theory, which assumes that children with MBID also do less well than children in the MA control group . This review will enhance our knowledge of the strengths and weaknesses of WM for this target group. This knowledge will lead to new insights regarding scholastic abilities, (individual) treatment options and support at school, ensuring an improvement in the care of children with MBID. Analysis of 40 studies focused on explicit memory in adults with MBID. This highlighted that people with MBID in general perform worse on explicit memory tasks compared to both CA and MA control groups. However, it should be noted that the aetiology of MBID in these studies was very diverse. Cohen [18,19] observed that important information could be lost as a result of the “summative effect”- information that could be of importance to the further treatment of specific patient groups falling significantly below the range of average performance. Therefore, given the heterogeneity of the MBID target group, a different method was selected, i.e., a systematic review, to enable a more detailed focus on how the differences in outcomes arise and what this may potentially mean for clinical practice. Relevant studies were searched in the following databases: Psycinfo, Medline and PubMed with publication dates from January 1970 to June 2018. A combination of the following terms was used: ‘mild intellectual disabilities’, ‘mild mental retardation’, ‘lower intellectual functioning’, ‘borderline intellectual functioning’, in combination with the following terms: ‘working memory’, ‘phonological loop’, ‘visuospatial sketchpad’, ‘visuo/visuospatial/verbal working memory’. Studies describing the relationship between WM in children (aged 4 to 18) with MBID (IQ range 50-85) were included. The original search returned 905 articles. The title and abstracts of these articles were screened by two researchers in line with the inclusion criteria, resulting in 62 potential articles. These articles were read in full and screened by these same two researchers according to the inclusion criteria. The references in these articles were also checked for potential additional relevant articles. Studies were excluded if (1) the IQ ranges of the participating children were lower than 50 or higher than 85, (2) children were diagnosed with a genetic syndrome: it is assumed for certain syndromes that they have specific WM profiles , (3) there was no comparison between children with MBID and typically developing children in the same age range (CA control group), and/or younger, typically developing children with the same mental age (MA control group). Finally, (4) only internationally peer-reviewed journals were selected. Figure 1 provides an overview of the selection procedure. The search resulted in 11 relevant articles. Table 1 describes the most important features of these studies. The following conclusion may be drawn from Table 1: 36% of the studies included a CA control group, 18% a MA control group and 45% included both. Furthermore, the distribution in the studies between children aged 4-12 years (55%) and adolescents aged 12-18 (45%) was approximately equal. Only three studies (27%) focused exclusively on verbal WM, the other studies (82%) focused on both verbal and visuospatial WM. In 8/9 studies, it appeared that children with MBID had a lower WM span compared to the CA control group (mean r=0.6 (large effect size), range 0.39-0.83). Significant differences between the groups were found on virtually all the tasks, both in terms of verbal WM and visuospatial WM. One study revealed different outcomes, i.e., children with MBID had comparable scores on visuospatial WM tasks compared to typically developing children in the same age range . In this study, the average 12-year old children were divided into two groups based on IQ scores: an IQ range between 70-85 (higher functioning) and an IQ range between 50-70 (lower functioning). The higher functioning children with MBID scored comparably on visuospatial WM tasks compared to the CA control group; this was not the case for lower functioning children with MBID and only appeared to be the case for the visuospatial domain. On verbal WM tasks both the children with higher and lower IQ ranges scored worse compared to the CA control group. This difference in functioning on verbal WM tasks was also found by Schuchardt et al. , both for low functioning and high functioning children with MBID. Unfortunately, visuospatial WM was not investigated in this study. In contrast to the previous studies, Alloway  demonstrated that higher functioning children with MBID performed worse on visuospatial WM tasks compared to the CA control group. It should be noted here that the children with MBID in this study were compared to a control group with a mean IQ of 118 (above average), meaning this control group was potentially less representative and could have led to an erroneous lower score. In addition to comparisons with CA groups, some researchers have also compared a group of lower functioning children to a group of higher functioning children with MBID. Saeed and Tahir  concluded that higher functioning children with MBID performed better on certain visuospatial WM tasks, and on one of the three verbal WM tasks, compared to lower functioning children with MBID. In a study by Henry , higher and lower functioning children with MBID scored comparably on all three of the represented verbal WM tasks. The difference in the cut-off score employed in the studies by Saeed and Tahir (low functioning IQ score 40-65, high functioning IQ 66-79) and Henry (low functioning IQ score 50-70, high functioning IQ score 70-85) may, perhaps, explain the difference in these findings. The differences in the applied ranges did, after all, lead to a lower mean IQ score in Saeed and Tahir’s study, compared to that by Henry. Saeed and Tahir  did not investigate whether the higher functioning children with MBID also performed on the verbal or visuospatial WM tasks compared to a CA control group, as they only compared the total group with MBID to the CA control group. In summary, our review shows clear differences in WM span between children with MBID compared to a CA control group. Children with MBID have, in general, a lower WM span, in terms of verbal as well as visuospatial WM, compared to typically developing children in the same age range. Lower functioning children with MBID (IQ range 50-70) have poorer scores on verbal and visuospatial WM tasks compared to higher functioning children with MBID (IQ range 70-85). In comparison with chronological age-group peers, verbal WM may be viewed as a weakness for both higher and lower functioning children with MBID, whereas in contrast to this, visuospatial WM appears to follow a normal development, and may be viewed as a strength for higher functioning children with MBID. In seven studies, a comparison was made between children with MBID and a matched control group comprising younger children of average ability with the same MA, see Table 1 for an overview. The outcomes in terms of verbal WM were not unanimous. Some studies demonstrated that children with MBID performed less well on verbal WM tasks [15,24,25], whereas other studies showed that children with MBID had comparable or even better scores compared to a MA control group [21,25-28]. Van der Molen et al. only found these differences after correcting for behavioral problems. When the results from the different studies are set side by side, it is noticeable that children with MBID with a MA of 7 or younger (irrespective of CA) perform worse on verbal WM tasks compared to younger children of average ability with the same MA . In contrast, children with MBID with a MA of 7 or older perform comparably or even better than seven-year-old children of average ability [21,26-28]. An exception to this is the studies by Van der Molen and colleagues [24,25]. It should be noted here that differences in demographic details may have influenced these differences. For instance, in the studies by Schuchardt et al. and Van der Molen et al. 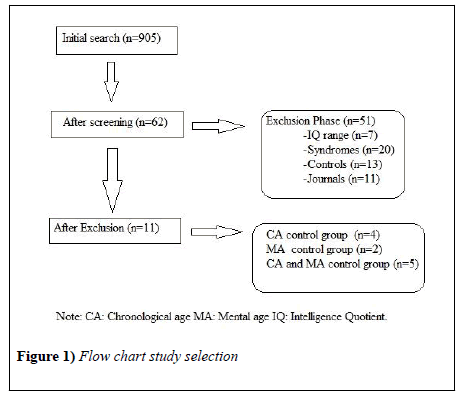 children with a comparable age and IQ range (15 years, IQ 60-70) were compared with a different MA control group (7.1 and 10.5 years, respectively). It is reasonable to assume that the adolescents in the Van der Molen study performed worse on verbal WM tasks than the MA control group because this MA control group was considerably older than those in the other studies. The weak correlations between different IQ tests used in the relevant studies and the different ways in which MA was calculated could explain the cause of the differences found between the studies. The majority of studies demonstrated that children with MBID perform as well as the MA control group when focusing on the visuospatial WM in children with MBID, compared to a MA control group [21,24,25,28]. Henry et al. demonstrated that children with MBID even performed better than the MA control children. Children with MBID performed worse on a visuospatial WM (Odd-one-out) compared to a MA control group in two studies [15,26]. In the Danielsson et al. study it remains unclear what the average IQ of the children with MID was and how the associated MA was calculated for these children, which hinders the comparison between this and other studies. In summary, it may be stated that there are differences in verbal WM performance between children with MBID and younger, typically developing children with the same MA. When the mental age of children with MBID is lower than 7 years (irrespective of the chronological age), they score worse on verbal WM tasks compared to a MA control group. On the other hand, when MA is above 7 years (irrespective of chronological age) the verbal WM performance is in line with younger, typically developing children with the same MA. In contrast to verbal WM, the visuospatial WM of children with MBID appears to be in line with their MA and is, therefore, a relative strength of these children. This systematic review aimed to detail the strengths and weaknesses in WM of children with MBID (IQ between 50-85). This is important to enable special support and develop (individual) treatment methods for this group of children with limited cognitive and adaptive skills. Children with MBID were compared with typically developing children at the same chronological age and/or with younger, typically developing children at the same mental age. The results demonstrated that the visuospatial WM of lower functioning children with MBID (IQ score 50-70) was comparable to that of younger, typically developing children at the same mental age. This is in line with the developmental theory that states that children with intellectual disabilities develop in a comparable way to the average ability children, albeit that this development is slower. Contrary to expectations, we observed that higher functioning children with MBID (IQ score 70-85) had a visuospatial WM functioning comparable to that of typically developing age-group peers; there did not appear to be any deficiency in general. In respect of verbal WM, it was difficult to make a distinction between high and low functioning children with MBID due to few publications in this area. It may, however, be concluded that children with MBID and a mental age above 7 years function comparably or even better than younger typically developing children with the same mental age, irrespective of chronological age. However, for mental age younger than 7 years, children with MBID perform less well than younger, typically developing children at the same mental age: There appears to be a structural defect in verbal WM. However, as far as we know there is no neurological proof for this defect. It should be noted here that the mental ages of the children with MBID included in this systematic review were on average not younger than 6 years, and therefore this statement is based on a very narrow age range. Nevertheless, this finding agrees with studies in adults with MBID and a mental age below 7 years [29,30]. These studies also demonstrated that individuals with a learning disability and an average mental age between 5.6 and 6.6 years perform worse on verbal WM tasks compared to younger, typically developing children at the same mental age. Aside from the relatively robust conclusions that may be drawn from this study, there are also some more nuanced remarks. It may be concluded, when focusing on research aimed at visual equivalence effects (visually different items are remembered better than visually equivalent items; Hitch et al.) in children with MBID, that these are found in children with MBID as well as in younger, typically developing children at the same mental age. This could suggest that children with MBID can use visual code strategies to solve visuospatial WM recall tasks in line with their mental age [15,32]. In the study by Rosenquist et al. children with MBID even performed better on visual equivalence tasks than expected on the basis of their mental age. The ability to utilize properly developed visual coding strategies (storing meaningful visual imagery), could be the basis for the fact that the visuospatial WM appears to be a (relative) strength for children with MBID. This relatively simple skill is already present around age 5 in typically developing children . It is possible that children with MBID tend to employ their strong (visual WM) side at an earlier stage to solve problems, meaning that in the course of their development their (verbal WM) shortcomings continue to increase. This study only reviewed working memory, and not short-term memory. However, defects in short-term memory could perhaps explain the defects demonstrated in this study. For instance, children with MBID and a mental age of 7 years or younger (irrespective of chronological age) are unable to automatically repeat incoming information [15,32,34,35]. This is something that typically developing children can do at that age , which is an important advantage to prevent information disappearing (too rapidly) from STM. This lack of automatic rehearsal could be interpreted as being indicative of slowed or erratic development of verbal WM in lower functioning MBID children (with a mental age below 7 years). This is in line with conclusions drawn by Jarrold et al. in their research about short term memory in individuals with Down Syndrome. They also argue that it is not clear whether the onset of rehearsal in atypically developing individuals is determined by age or by intellectual level. Perhaps children with MBID and a mental age younger than 7 years perform worse on verbal WM tasks than younger, typically developing children at the same mental age because they basically possess inadequate verbal skills to compensate for their more limited verbal STM . It could be that the older children with MBID have an advantage in terms of longer-term exposure to language practice compared to typically developing younger children at the same mental age. This would, perhaps, mean they had more compensation options available to solve WM tasks. There appears to be a pivotal point when children with MBID reach a mental age around 10 years, and they are no longer able to match typically developing children at the same mental age in terms of verbal WM performance . This could be the cognitive ceiling for children with MBID; they are no longer able to compensate for their lower verbal STM capacity and/or lack of (increasingly more complex) automatic rehearsal strategies. This type of cognitive ceiling could also occur in the visuospatial domain. Maehler et al. investigated the visuospatial STM in children with MBID (mean age 9 years, mean IQ score 75). This group scored worse on four out of five visuospatial STM tasks; however, on one task (a simple Corsi Block tasks) they performed as well as a CA control group. On the other hand, in a study by Schuchardt et al. older children (mean age 15 years, mean IQ 83) with MBID scored worse on the same visuospatial STM task. This could suggest that the development of visuospatial STM in higher functioning children with MBID (IQ 70-85) potentially progresses in the same way as typically developing at the same age for a certain period (up to the start of adolescence). Whether this is also the case for visuospatial WM tasks and/or for lower functioning children with MBID was not further investigated in these two studies; however, it is conceivable that a cognitive ceiling also occurs for the visuospatial domain in children with MBID. It is anticipated that this ceiling is higher for the visuospatial domain (late adolescence) than the verbal domain (start of adolescence) and that these ceilings are reached earlier than for typically developing children. This is in line with the developmental theory which supposes that development in children with MBID is comparable to, but slower and completed earlier than that of typically developing children . Furthermore, it agrees with findings from Van der Molen et al. who concluded that verbal STM does not develop any further beyond the age of 10. The current study shows that WM is weak in lower functioning children with MBID. This is unfortunate as WM is associated with poorer school performances. In general, children with MBID have difficulties with scholastic abilities . They require support more often at school . Several studies have demonstrated that reading and writing tax verbal WM skills in particular [4,40]. Numeracy skills in typically developing children are particularly associated with visuospatial WM . Hereby, it should be noted that verbal WM appears to be crucial for the basics of numeracy (e.g., learning to count). This is in agreement with studies into school performance of children with MBID, which have demonstrated that verbal WM plays an important role in learning [28,42] and is associated, amongst other things with numeracy skills . The fact that children with MBID have, in particular, shown structural shortcomings in their verbal WM capacity, may explain their problems in learning to read and write and the automatization of numerical skills. It has been shown that STM in children with MBID could be improved through teaching verbal repetition strategies [43-45]. However, this did not lead to better results compared to training without any specific strategy related instructions . Children with MBID can improve their ability to repeat items in the correct order through training on verbal STM tasks such as these. However, when children with MBID had to undertake different, more ecological memory tasks (e.g., a recall task), they did not use the newly acquired repetition strategies by themselves. There are, therefore, question marks about the generalizability of these training programs. There are also various computer programs, such as Cogmed  or Braingame Brian , which purport to train visuospatial as well as verbal short-term memory (STM) and WM. These programs are not only aimed at the weaker (verbal) aspect of children with MBID but may also provide a boost to their relatively stronger (visual) aspects. This could lead to an increase in information processing capacity and/or compensation strategies in solving cognitive scholastic tasks, amongst others. Intensive and adaptive computer training programs have been shown to be effective for children with an attention disorder (ADHD) (see review by Chacko et al. ) and for children with learning problems . Progress on (untrained) STM and WM tasks and other neurocognitive functions, such as inhibitory control, complex reasoning and numerical skills was maintained up to 3 to 6 months after training . However, the generalizability of these training programs has been disputed. Three meta-analytic reviews of the effectiveness of WM training concluded that these types of programs mainly display transient, trainingspecific effects, which are barely generalizable to daily activities [50-52]. The inconsistent findings in terms of the effectiveness of WM training could be explained by variability between participants, such as age, status , motivation, training progression , better performance on verbal WM tasks at the start of training , baseline cognitive capacity  and/or variability in the gene coding of the Dopamine Transporter (DAT1) . In children with MBID, training both the visuospatial, as well as verbal STM and WM capacity through learning different memory strategies, could be very promising as shown in a meta-analytic review . The studies included children with MBID and Down syndrome and showed large improvements in verbal and visuospatial STM compared to WM . A study into a visuospatial WM training program, the Odd Yellow method in adolescents with only MBID (13-16 years, IQ 55-85) showed significant progress in verbal short-term memory. These results were maintained up to 10 weeks after the training, and also showed significant improvements at follow-up in terms of visual WM, numerical skills and daily memory . Another study demonstrated that children with MBID (6-12 years) showed progress in WM and language comprehension once they had completed Cogmed WM training . Only visuospatial WM was trained in this version, and no effects were determined regarding abstract reasoning ability. The most important aspects of training success appeared to be gender (girls were more successful), age (adolescents benefit more), IQ (the higher, the better), lack of co-morbidity, and higher baseline verbal WM prior to the start of training. No significant training effects were found a year after training. Probably, the training should either be presented with longer and/or more sessions or should be regularly repeated to maintain the positive effects. Butler et al. reviewed the literature about the numeracy training for children with MBID and concluded that frequent and “drill-and-practice” were potentially the effective ingredients within this type of training program. Jansen et al. demonstrated that children with MBID made progress on automation of calculation tasks when they practiced regularly on a numeracy program that provided direct feedback. In summary, it may be stated that limitations in WM in children with MBID play a role in their learning difficulties. Structural shortcomings in verbal WM in children with MBID may lead to increasing problems with learning numerical skills, reading and writing. This may be caused by a limited WM capacity and not using effective strategies. Training interventions purely aimed at learning verbal repetition strategies have shown an insufficient effect in these children, as the newly learned strategies to enhance processing capacity barely generalize into untrained, daily memory tasks. Training programs that both train WM and teach strategies appear to link in better with these children, given their learning appears to be sensitive to direct and frequently provided feedback and receive support in the generalization of the learned material in daily practice. The influence of individual differences (gender, age, IQ, baseline WM capacity) of children with MBID should be explored further within effectiveness studies of training interventions, in addition to the effect of training duration and intensity. It is recommended, based on the findings in this review, that future research is aimed at what type of children with MBID and/or what type of pre-conditions lead to individual training success, for instance using multiple N=1 study . In addition to the various child factors, future research could also focus on the effect of coaching within training and/or the effect of training when this is presented for longer and more intensively to children with MBID and to what extent the involvement of the environment (parents, teachers) leads to an increase in generalization from the learned to daily practice. This is in line with research mentioning that training and challenging WM is necessary for improving them, but benefits will be greater if emotional, social and physical needs are also addressed . Furthermore, the age at which WM training should be offered to children with MBID should be investigated in more detail. It is possible that children with MBID benefit the most from training around a MA of 10 years, given they then benefit from the highest baseline . This would be in line with a review of WM training in children with learning disabilities, which showed that children aged 10 and older profited more from training . One limitation of this study is the fact that, due to the pre-stipulated inclusion criteria, only part of the included studies was aimed at the various aspects of WM in this target group and, therefore, conclusions may only be drawn on the basis of these details. The conclusions above should, therefore, be considered in this light. Another limitation is that in some cases, different inclusion methods were used between the included studies. In the majority of cases, children were included or excluded on the basis of a total IQ, but in one case this was done on the basis of verbal IQ . Given that it is known that children with MBID mostly score lower on their verbal capacities, compared to their performance capacities, a proportion of the included children with MBID would have been recruited on a lower IQ than expected on the basis of clinical practice. Inclusion on the basis of total IQ would perhaps do more justice to the heterogeneity of this target group. On the other hand, one may ask whether the specific shortcomings in terms of verbal WM in children with MBID continue to persist when correcting for verbal IQ, although the Russel et al. study demonstrated that verbal WM shortcomings remained, despite inclusion based solely on verbal IQ [63-65]. These limitations aside, this review provides a contribution to clinical practice. It is of importance for mental health careers and teachers to recognize and acknowledge WM problems, to develop interventions for this specific group in special to prevent any further asymmetrical development. In addition to this, the awareness of the potential of WM training in certain children with MBID is an important aspect to be included in the care of children with MBID. Moreover, finally, it is important, where ever possible, to make use of the relatively strong visuospatial aspect to optimize the learning of children with MBID. Westerinen H, Kaski M, Virta L, et al. Prevalence of intellectual disability: a comprehensive study based on national registers. J Intellect Disabil Res 2007;51(9):715-25. Verhoeven L, Vermeer A. Literacy achievement of children with intellectual disabilities and differing linguistic backgrounds. J Intellect Disabil Res 2006;50(10):725-38. Simonoff E, Pickles A, Chadwich O, et al. The Croydon assessment of learning study: prevalence and educational identification of mild mental retardation. J Child Psychol Psychiatry 2006;47(8):828-839. Bull R, Espy KA, Wiebe SA. Short-term memory, working memory, and executive functioning in preschoolers:Longitudinal predictors of mathematical achievement at age 7 years. Dev Neuropsychol 2008;33(3):205-28. Schuiringa H, van Nieuwenhuijzen M, Orobio de Castro B, et al. Executive functions and processing speed in children with mild to borderline intellectual disabilities and externalizing behavior problems. Child Neuropsychol 2017;23(4):442-62. Lifshitz H, Kilberg A, Vakil E. Working memory studies among individuals with intellectual disability: An integrative research review. Res Dev Disabil 2016;59:147-65. Gathercole SE, Alloway TP. Practitioner Review: Short-term and working memory impairments in eurodevelopmental disorders: diagnosis and remedial support. J Child Psychol Psychiatry 2006;47(1):4-15. Dekker MC, Koot HM. DSM-IV disorders in children with borderline to moderate intellectual disability. I: Prevalence and impact. J Am Acad Child Adolesc Psychiatry 2003;42(8):915-22. Verhulst FC, van der Ende J, Ferdinand RF, et al. The prevalence of DSM-III-R diagnoses in a national sample of Dutch adolescents. Arch Gen Psychiatry 1997;54(4):329-36. Emerson E. Prevalence of psychiatric disorders in children and adolescents with and without intellectual disability. J Intellect Disabil Res 2003;47(1):51-8. Baddeley A. Working memory. Clarendon Press, Oxford 1986;11. Alloway TP, Gathercole SE, Willis C, et al. A structural analysis of working memory and related cognitive skills in young children. J Exp Child Psychol 2004;87(2):85-106. Gathercole SE, Alloway TP. Working memory and learning: A teachers guide. Sage Publications London, UK 2008. Henry LA. The development of working memory in children. Sage Publications, London 2012. Russel J, Jarrold C, Henry L. Working memory in children with autism and with moderate learning difficulties. J Child Psychol Psychiatry 1996;37(6):673-86. Baddeley A. The episodic buffer: A new component of working memory? Trends Cogn Sci 2000;4(11):417-23. Bennet-GD, Zigler E. Resolving the developmental-difference debate: An evaluation of the triarchic and systems theory model. In Burack JA, Hodapp RM, Zigler E (eds. ), Handbook of mental retardation and development. Cambridge, Cambridge University Press, UK. 1998;209-39. Cohen J. Statistical power analysis for the behavioral sciences. Hillsdale: Laurence Erlbaum Associates, 2nd edn, 1988. Cohen J. A power primer. Psychol Bull 1992;112(1):155-59. Henry LA. How does the severity of a learning disability affect working memory performance? Memory 2001;9(4-6):233-47. Schuchardt K, Gebhardt M, Maehler C. Working memory functions in children with different degrees of intellectual disability. J Intellect Disabil Res 2010;54(4): 346-53. Alloway TP, Alloway RG. Investigating the predictive roles of working memory and IQ in academic attainment. J Exp Child Psychol 2010;106(1):20-9. Saeed T, Tahir S. Working memory in children with Intellectual Disability (ID). J Psychol Clin Psychiatry 2016;6(4):00366. Van der Molen MJ, Van Luit JE, Jongmans MJ, et al. Memory profiles in children with mild intellectual disabilities: Strengths and weaknesses. Res Dev Disabil 2009;30(6):1237-47. Van der Molen MJ, Van Luit JEH, Van der Molen MW, et al. Effectiveness of a computerized working memory training in adolescents with mild to borderline intellectual disabilities. J Intellect Disabil Res 2010;54(5):433-47. Danielsson H, Henry L, Messer D, et al. Strengths and weaknesses in executive functioning in children with intellectual disabilities. Res Dev Disabil 2012;33(2):600-07. Henry LA, MacLean M. Working memory performance in children with and without intellectual disabilities. Am J Ment Retard 2002;107(6):421-32. Henry L, Winfield J. Working memory and educational achievement in children with intellectual disabilities. J Intellect Disabil Res 2010;54(4)354-65. Carreti B, Belacchi C, Cornoldi C. Difficulties in working memory updating in individuals with intellectual disability. J Intellect Disabil Res 2010;54(4):337-45. Lanfrachi S, Cornoldi C, Vianello R. Working memory deficits in individuals with and without mental retardation. J Cogn Educ Psychol 2002;2(3):301-12. Hitch GJ, Woodin ME, Baker S. Visual and phonological components of working memory in children. Mem Cognit 1989;17(2):175-85. Rosenquist C, Conners FA, Roskos-Ewoldsen B. Phonological and visuo-spatial working memory in individuals with intellectual disability. Am J Ment Retard 2003;108(6):403-13. Palmer S. Working memory: A developmental study of phonological recoding. Memory 2000;8(3):179-93. Hasselhorn M, Maehler C. Phonological working memory of children in two German special schools. Intl J Disabil Dev Educ 2007;54(2): 225-44. Henry L, Conners F. Short-Term Memory Coding in Children with Intellectual Disabilities. Am J Ment Retard 2008;113(3):187-200. Gathercole SE, Hitch GJ. Developmental changes in short-term memory: A revised working memory perspective. In. Collins A, Gathercole SE, Conway MA, Morris PE (eds. ), Models of short-term memory Hove, Psychology Press, UK 1993. Jarrold C, Baddeley AD, Hewes AK. Verbal Short-term Memory Deficits in Down Syndrome: A Consequence of Problems in Rehearsal? J Child Psychol Psychiatry 2000;41(2):233-44. Maehler C, Schuchardt K. Working memory functioning in children with learning disabilities: does intelligence make a difference? J Intellect Disabil Res 2009;53(1):3-10. Van der Molen MJ, Henry LA, Van Luit JEH. Working memory development in children with mild to borderline intellectual disabilities. J Intellect Disabil Res 2014;58(7):637-50. Jaeggi SM, Buschkuehl M, Jonides J, et al. Short- and long-term benefits of cognitive training. Proceedings of the National Academy of Sciences of the United States of America 2011;108(25):10081-86. Holmes J, Adams JW. Working memory and children’s mathematical skills: Implications for mathematical development and mathematics curricula. Educ Psychol 2006;26(3):339-66. Jansen BRJ, Van der Molen MJ, De Lange E. Math practice and its influence on math skills and executive functions in adolescents with mild to borderline intellectual disabilities. Res Dev Disabil 2013;34(5):1815-24. Brown AL, Campione JC, Bray NW, et al. Keeping track of changing variables: effects of rehearsal training and rehearsal prevention in normal and retarded adolescents. J Exp Child Psychol 1973;101(1):123-31. Engle RW, Nagle RJ. Strategy training and semantic encoding in mildly retarded children. Intelligence 1979;3(1):17-30. Kramer JJ, Engle RW. Teaching Awareness of Strategic Behavior in Combination with Strategy Training: Effects on Children’s Memory Performance. J Exp Child Psychol 1981;32(3):513-30. Klingberg T, Fernell E, Olesen PJ, et al. Computerized training of working memory in children with ADHD- A randomized controlled trial. J Am Acad Child Adolesc Psychiatry 2005;44(2):177-86. Prins PJ, Brink ET, Dovis S, et al. “Braingame Brian”: toward an executive function training program with game elements for children with ADHD and cognitive control problems. Games Health J 2013;2(1):44-9. Chacko A, Feirsen N, Bedard AC, et al. Cogmed Working Memory Training for Youth with ADHD: A Closer Examination of Efficacy Utilizing Evidence-Based Criteria. J Clin Child Adolesc Psychol 2013;42(6):769-83. Roording-Ragetlie S, Klip H, Buitelaar J, et al. Working Memory Training in Children with Neurodevelopmental Disorders. Psychology 2016;7(03):310-25. Hodgson K, Hutchinson AD, Denson L. Nonpharmacological treatments for ADHD. A meta-analytic review. J Atten Disord 2014;18(4):275-82. Melby-Lervag M, Hulme C. Is working memory training effective? A meta-analytic review. Dev Psychol 2013;49(2):270-91. Shipstead Z, Redick TS, Engle RW. Is working memory training effective? Psychol Bull 2012;138(4):628-54. Söderqvist S, Nutley SB, Ottersen J, et al. Computerized training of non-verbal reasoning and working memory in children with intellectual disability. Front Hum Neurosci 2012;6:1-8. Mackey AP, Hill SS, Stone SI, et al. Differential effects of reasoning and speed training in children. Dev Sci 2011;14(3):582-90. Söderqvist S, Nutley SB, Peyrard-Janvid M, et al. Dopamine, working memory, and training induced plasticity: Implications for developmental research. Dev Psychol 2012;48(3):836-43. Danielsson H, Zottarel V, Palmqvist L, et al. The effectiveness of working memory training with individuals with intellectual disabilities-a meta-analytic review. Front Psychol 2015;17(6) :1230. Moalli E. Conoscenze Sulla Memoria e Prestazioni di Memoria in Individui con Sindrome di Down econ Sviluppo Tipico: Effetti di Training di Breve Durata, University of Padova, Padova 2006. Butler FM, Miller SP, Lee K, et al. Teaching mathematics to students with mild-to-moderate mental retardation: A review of the literature. Ment Retard 2001;39(1):20-31. Gagnier JJ, Kienle G, Altman DG, et al. The CARE guidelines: consensus-based clinical case report guideline development. J Clin Epidemiol 2014;67(1): 46-51. Diamond A, Ling DS. Conclusions about interventions, programs, and approaches for improving executive functions that appear justified and those that, despite much hype, do not. Dev Cogn Neurosci 2016;18:34-48. Peijnenborgh JC, Hurks PM, Aldenkamp AP, Vles JS, Hendriksen JG. Efficacy of working memory training in children and adolescents with learning disabilities: A review study and meta-analysis. Neuropsychol Rehabil 2016;26(5-6):645-72. Lifshitz H, Stein S, Weiss I, et al. Meta-analysis of explicit memory studies in populations with Intellectual Disability. Eur J Spec Needs Educ 2011;26(1):93-112. Zheng X, Swanson HL, Marcoulides GA. Working memory components as predictors of children’s mathematical word problem solving. J Exp Child Psychol 2011;110(4):481-98. Gathercole SE, Pickering SJ, Ambridge B, et al. The structure of working memory from 4 to 15 years of age. Dev Psychol 2004;40(2):177-90.